The internationally-beloved star of P-Productions' SPECTREMAN (1971-72), began his career by joining the Actor's School at Toei Studios while he was still a student at Hosei University, and made his first screen appearance in Episode 23 of LIL' DEVIL in 1967. The same year, he entered and passed as one of Toho Stuido's "8th New Faces Competition", and was given the role of "Detective Namiki" in the police series TOKYO BYPASS COMMAND (1968-70). 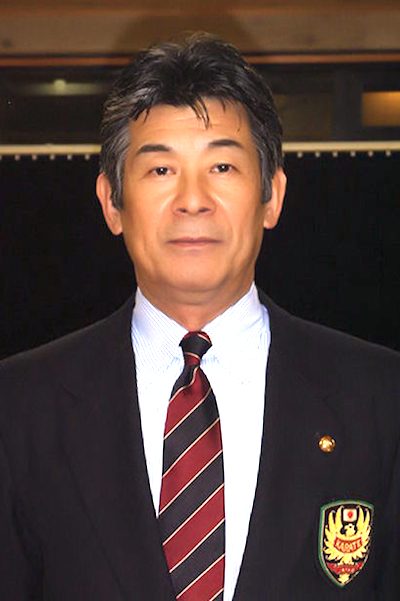 He left Toho and joined Sachiko Productions in 1969, and landed a succession of guest starring roles on television, and the role of "Shunsuke Tanami" in the feature film, THE STAR OF JUDO (1970). After appearing in two episodes of Toei's STRAIGHT PATH OF JUDO (1967-71), he was cast as "Joji Gamou" by Fuji Television for SPACE SIMIAN GORI in 1971 (later becoming SPECTREMAN). In May of that same year, he married his "New Faces" alumni, Akiko Sekiguchi. After SPECTREMAN wrapped production in 1972, Narikawa appeared in guest starring roles in a number of television shows, including some popular tokusatsu series, including KAMEN RIDER (1971-73), THE VIGILANT LION KNIGHT (1972-73), ROBOT DETECTIVE (1973), ULTRAMAN LEO (1974-75), and was a regular on the popular cop show, TOMMY & MATSU (1979-82). He retired from acting to focus on his martial arts career in 1983, and became founder and president of the Gensei-Ryu Seidokai International Karate Federation, based in Tokyo. Grand Master Narikawa also took time out to travel to conventions in France and Brazil, where SPECTREMAN still has a legion of fans, and appeared with notable tokusatsu stars such as Kenji Ohba (SPACE SHERIFF GAVAN) and Hiroshi Watari (SPACE SHERIFF SHARIVAN). He also authored a book about SPECTREMAN, published by Sony Magazines in 2000. Grand Master Narikawa succumbed to lung cancer on January 1, 2010.
merci pour cette hommage !